Every time I go to the snows, I feel compelled to roll down the slopes and break into song and dance. It has to be the diet of Bollywood films I was raised on. 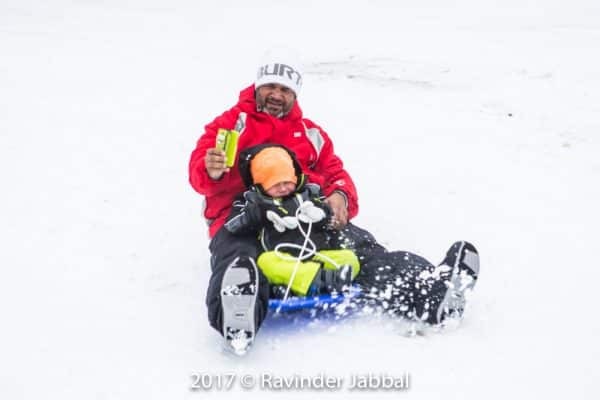 Bollywood, with its penchant for filmy romance in the Swiss Alps and valleys of Kashmir, is responsible for many sappy sentiments attached to the snow, including mine. 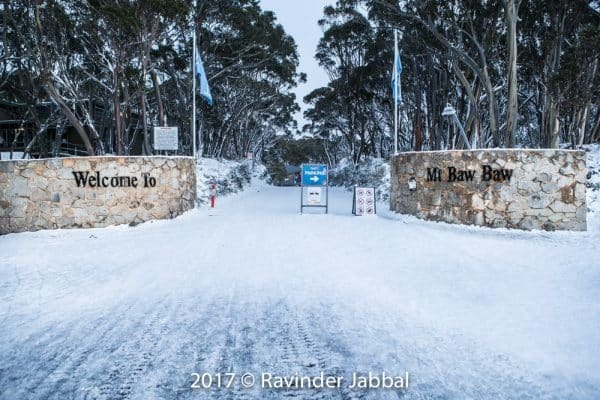 So it’s great news that the hills will soon be alive with the sound of (Bollywood) music at Mount Baw Baw, Melbourne’s closest downhill ski resort, with their upcoming Bollywood at Baw Baw event scheduled for the weekend of 9 and 10 September. Expect vibrancy and colours as the entire village gets decked up with the desi theme. The organisers are going all out with henna artists, DJ, dhol, Indian food and the quintessential Bollywood dance and workshop. So, plenty of fix-the-light-bulb and pat-the-dog movements to look forward to! 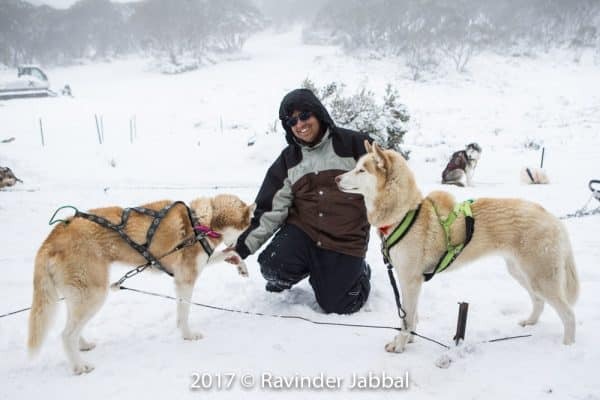 Speaking of patting dogs, the time we spent getting up, close and playful with the howling huskies was by far the most exciting part of our trip at Mt Baw Baw. We were there, not too long ago, taking a much-needed break from a ‘headless chook-like existence.’ Getting there is easy: It’s a beautiful two-and-a-half -hour drive to the alpine village situated at the Southern boundary of the Victorian Alps. Escaping into the white silence was the best thing we could have done for sanity. We got up to a lot of fun and a little mischief but our most memorable time was spent getting acquainted with the dog sled team before they whisked us away to experience the jaw-dropping snowy vistas. We had the pleasure of meeting musher Rob who took us around on a Sherpa snowmobile and introduced us to the canine inhabitants of Baw Baw. Zara, Sarabi, Dee, Jack and Casper, each of the dogs loved the affection given to them as they rested in between the rides. Named after the Mt Baw Baw Dog Sled Dash, the Howling Huskys tour is a dash around the Latrobe trail with an experienced musher and a team of huskies. 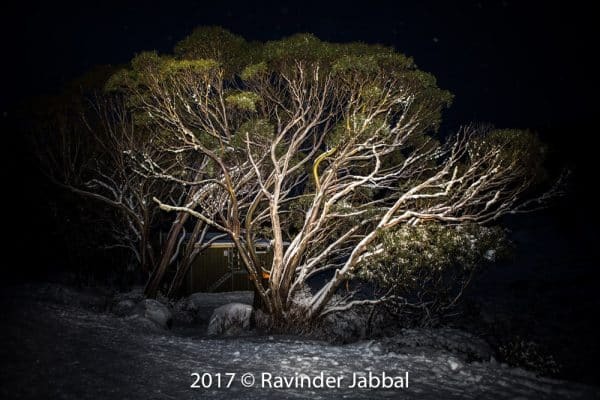 The team took us through the labyrinth of snow gums in the backcountry of Baw Baw, giving us an opportunity to enjoy alpine beauty at its best. According to Rob, many of the dogs are rescued and Baw Baw becomes their new caring family and home. We got to know the smart ones from the cheeky ones as we patted and cuddled them. 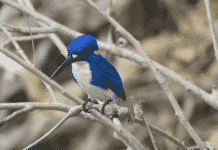 It was a delightful trip with plenty of photo opportunities of the majestic mountains and the friendly animals. Everything is within a few minutes’ reach in this intimate snow village. 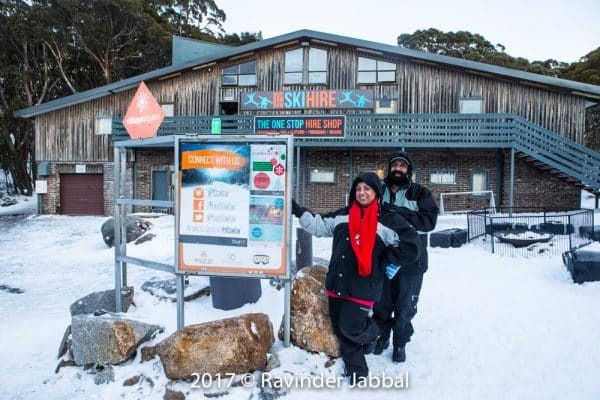 It took us no time to hire our snow gear from Mount Baw Baw Ski Hire and grab a deliciously welcoming hot meal at the Village restaurant before we hit the ski slopes. The weather was perfect for some cross country skiing. It snowed through the whole time we were there and it was an amazing experience for city slickers like us to savour the fresh mountain air and tread on soft alpine snow. With five lifts to choose from that open up over 30 hectares of mixed terrain, we decided to try our hand at the winter sport. With boots, poles, skis, goggles et al, we found ourselves on the beginners slope and, given our lack of skiing finesse, stayed there. As the snow continued to fall softly and endlessly to the ground, the dark contrast between the earth and the sky converted the landscape into a monochrome. Our bright ski gear was the only indication that the world was not really black and white. 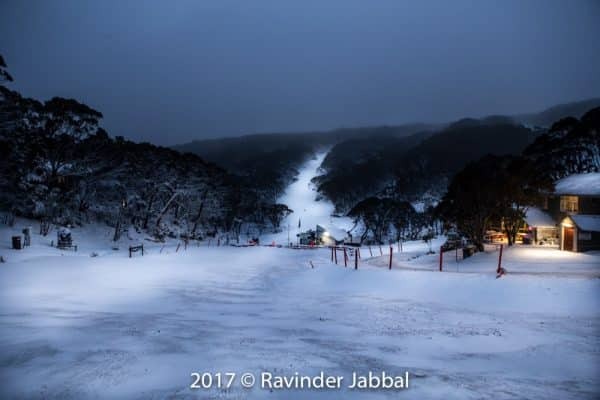 Later on, ensconced in the warmth of our very well maintained Snowgum Apartment, we pored over photos of our hilarious ski bloopers in between sipping some wonderfully aged port. With Frosti Frog Hollow Toboggan run just outside our centrally located apartment, we had a tough time getting our son to come back in as he was having so much fun tobogganing down the slope. It was an uphill task though to climb back with the toboggan and he left only when it got too tiring. With food and facilities so easily accessible, we appreciated the close knit village even more. The menu offerings at most food joints are not gourmet but there is plenty to tuck into. The next day, we met a group of people who had travelled from Japan just to ski and stay at Baw Baw. “They are regulars,” said the friendly waitress at the Village restaurant, that’s aptly located in the heart of the village. “They come every year for a week and explore the mountains,” she added. No doubt, there was a lot to be explored in the alpine environment and many activities to keep us occupied. We made snow angels, built a snowman, took a dip in the spa pool, and played laser skirmish amongst snow-covered trees and took snowshoe tours. Interestingly, there were quite a lot of families from the Indian subcontinent visiting at the same time as me, though unfortunately I did not spot any Rishi Kapoors in Monte Carlo sweaters or any Sridevis in flimsy chiffon sarees. Ashish, who came to Baw Baw with his wife Dipti, shared his experience at the charming destination. Romance, unsurprisingly, was high on their agenda. “I am glad we made the decision to drive down and spend some quality time together here. It’s an exquisite setting for our third wedding anniversary, and reminded us of the Yashraj films where the hero would whisk his lady love to the lush settings of snow. It’s uber romantic,” said Ashish, dreamily. Taking in the tranquil panorama with its views of powdery snowflakes falling noiselessly to the ground, I couldn’t help but agree.